Every year I like to look back and reflect on things I have learned, things I have changed my mind about and of course clinical pearls that stand out. Over the past year, I have been sharpening my IASTM skills, begun to practice dry needling techniques, and scrutinizing my hip and core exercises that I routinely use in rehab. I look forward to sharing more about my clinical experiences with dry needling in 2014, but I feel the most critical and recurring theme of 2013 has been the overwhelming impact I have seen poor ankle dorsiflexion have on my patients. I treat scores or runners, triathletes and clients with knee pain. The most common issues in this group of clientele tends to be IT band friction syndrome or patellofemoral pain. Any time I evaluate a runner, I assess closed chain dorsiflexion (DF) mobility. This can be assessed in half kneeling on the floor or standing at a wall. I suggest removing the shoes during the assessment to eliminate any rise from the heel in the shoe that may bias the movement. In addition, I hold the ankle in subtalar neutral to get a true assessment without allowing pronation. The image below simply demonstrates the assessment position as well as the corrective exercise that can be used to facilitate better motion. Clients should be able to attain about 5 inches of clearance beyond the toes without lifting the heel or relying on pronation to get there. I routinely see limited mobility, and more importantly almost 100% of the time I find asymmetry on the side of the affected knee. I recently evaluated a 29 y/o active female client who does Crossfit 3x/week and likes to run. She has not been running much due to chronic right lateral knee pain and medial calf pain. Her goal is to get back to running half-marathons. Upon evaluation, her overhead squat assessment revealed pronation and external rotation bilaterally, right greater then left. Her standing wall DF assessment revealed nearly a 1 inch deficit on the right side (about 3 inches), while her left side was 4 inches. You can see the highlighted areas in the photo above. She has a marked amount of pronation in mid stance as well as left pelvic drop due to poor gluteal activation. The poor hip stability and activation on the right side also plays directly into TFL dominance with the repetitive femoral internal rotation and adducted position of her right hip.. This poor biomechanical chain is set into motion by poor dorsiflexion mobility. Runners can get away with this for shorter distances (3-4 miles) in many cases, but increased mileage leads to shin splints, calf strains, IT friction syndrome and patellofemroal pain. You can see how this poor kinetic chain movement leads to ongoing microtrauma and eventually debilitating pain and dysfunction. No matter how much one rests, going back to higher mileage will yield the same result. In my client’s case, she also had a trigger point in her medial soleus – another issue connected with the ankle mobility problem. Her primary treatment plan will focus on soft tissue mobilization for the gastroc/soleus complex, TFL/ITB and glutes/piriformis, ankle dorsiflexion mobility exercises, IASTM to her gastroc/soleus/Achilles, single leg balance and strengthening and hip/core activation and stability work. I am confident all of this will effectively resolve her pain. 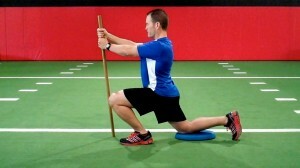 However, it all begins with restoring ankle mobility. They say a picture is worth a thousand words. 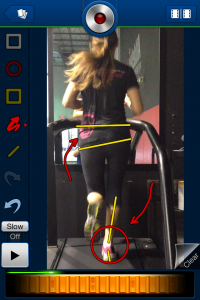 I strongly believe the picture I included of my client on the treadmill speaks volumes as to how poor ankle mobility can lead to unwanted compensatory motion, gluteal inhibition and overuse injuries. The take home message here is be sure to assess ankle mobility in the presence of any lower extremity pain or dysfunction as it is often a critical piece of the puzzle in the face or recurring injury and chronic pain. Wow! It has been a busy two weeks for me. I have been putting the final touches on a DVD and writing a ton of articles lately. I just returned from speaking for Power Systems at a Total Training Seminar in Missouri in late March. It is always interesting speaking and hearing other presenters. There is usually no shortage of controversy and conflicting opinions either when it comes to fitness and training. One speaker mentioned that it is perfectly okay to allow the knee to go over the toe with exercise. In fact, this presenter said it was desirable to maximize training. My talk (later on) was on bodyweight training for a healthier knee. Naturally, I was asked what I thought about the earlier comment. My answer was “it is complicated.” I am not sure that is what the audience wanted me to say. Pressed again later on, I acknowledged that in a repetitve training environment, lunging and squatting with the knee over the toe is not something I recommend. However, if I am retraining a client to be able to descend stairs one foot over the other, the knee does in fact move beyond the toes. So, there are times in life, where we need to think outside absolutes and adjust our thoughts and training to meet the needs of people at a current time and space so to speak. The real trick is knowing the client, their medical condition, their needs and measuring the response from the body. I hate protocols because no two people are the same, nor do their bodies heal and react the same way. But, let’s get back to the knee. I talked about assessing the knee and then integrating the “right exercises” to not only correct dysfunction but also to improve fitness and performance. If you think body weight training is useless or for sissies, you may want to think again particularly if you like to run and have any issues with patellofemoral pain (most women do have PF pain or early arthritis). Consider the research from the Journal of Orthopaedic and Sports Physical Therapy in 2003 where Powers et al. determined that PF joint forces are significantly greater with external loading versus bodyweight only in flexion angles begining at 45 degrees during eccentric loading (lowering down while peaking at 90 degrees) and concentric loading (rising up) at 90 and 75 degrees. What does this mean for you? Essentially, if you are a runner and suffer from PF pain, you may want to limit deeper range of motion with squatting and/or consider limiting the amount of external loading as well. Even better, you should be doing single leg training keeping this same information in mind. Training is an exact science and most people get it wrong all the time. That is why I am currently working on a Fit Knees DVD series to give trainers and consumers relevant and science based information to direct their training for optimal health and performance. I just finished volume three in this series and it is ready for official release this Friday. If you are a runner and want a blueprint to train for injury prevention and peak performance, this DVD is for you. Or, if you are a runner who is currently injured or has been plagued by overuse injuries, it is still for you as I have a complete progressive rehab series on the DVD to get you back up and running again. As a runner myself, I have put these strategies to good use with much success. I thought it was fitting to relase the DVD this week as I prepare to run my 4th half marathon in Charlotte this weekend. Below you will see the product display. As a blog subscriber or reader, I am offering you $10 off the normal price of $34.95 through midnight Saturday. Simply visit www.fitknees.com and use the copuon code BFITRUN (all caps) at checkout. I am confident you will find it valuable as it covers training from A-Z with warm-up prep, foam rolling, balance training, strength and power exercises, rehab and stretching. It is 65 minutes of power packed content. Here’s to healthier knees and happy running!